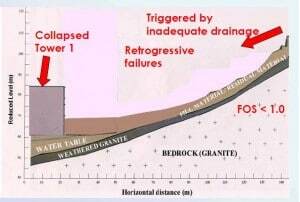 On December 11, 1993 at 1:35pm, the first tower of the Highland Towers apartment complex in Selangor, Malaysia fell, ultimately killing 48 people. The cause of failure was attributed to a landslide that occurred due to pipes that burst, allowing for the barren ground near the site to wash away. A pipe system was originally placed on a hill nearby the towers to divert water from a stream that normally flowed onto the site. Trees had also been previously cleared from that hill for a separate housing development project, so the soil had no protection against erosion. During a 10-day monsoon, the pipes burst from the large amount of water flowing through them, letting that volume of water flow down the hill. The combination of monsoon rains and loose soil led to a landslide that brought Block One of the Highland Towers with it. A mass of mud equivalent to 200 jumbo-jets (around 100,000 sq. meters) came sliding down the hill, breaking retaining walls, and finally destroying the pier foundation system of the tower (please see Figure). The tower was able to stand for a few days, and showed warning signs of failure such as cracked walls and pavements. However, Tower One was destined to fall. Luckily, some residents were able to evacuate the building prior to the collapse because they knew something was wrong. Residents in the neighboring Towers Two & Three were quickly evacuated, and not allowed to return for fear of those towers also collapsing . Tragedies like this can be difficult to prevent. However, certain measures can be taken to protect buildings from landslides. Firstly, the effects of erosion should be taken into account when clearing a plot of land. 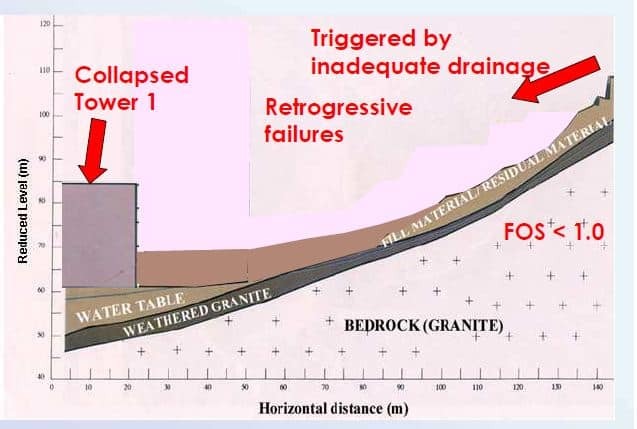 Secondly, the retaining walls should be designed to be stronger as well as go deeper in the ground to further prevent large masses of land shifting (please see Figure 4). In Malaysia, where there are times of the year with constant downpour, it is difficult to design for such catastrophes. In this case, it seemed that all the necessary precautions had been taken to prevent such a tragedy.